Yesterday was the anniversary of the big day when the public was presented with the results of the giant Table Talk project. There was a nice reception on the main floor of the Jersey Shore Arts Center, and a decent crowd. I've been meaning to ask Molly if she's heard anything from any of the table owners, but during the school year our schedules don't match up too often. But I was thinking about it today, after reading online about yet another controversy with the president of Kean University. His latest triumph is unveiling a new table they bought (in China) for a conference room in one of the new buildings. The table is made from oak with cherry veneer, loaded with electronics, lots of fancy surface decorations. The 22 foot diameter table can seat 23 people. All this for only $219,000.00. When questioned why, he just said "Why not?" None of the 18 tables I built and Molly carved and painted were as large as this one, but put together they could have seated a lot more people, and our total for materials and labor was a whole lot less. 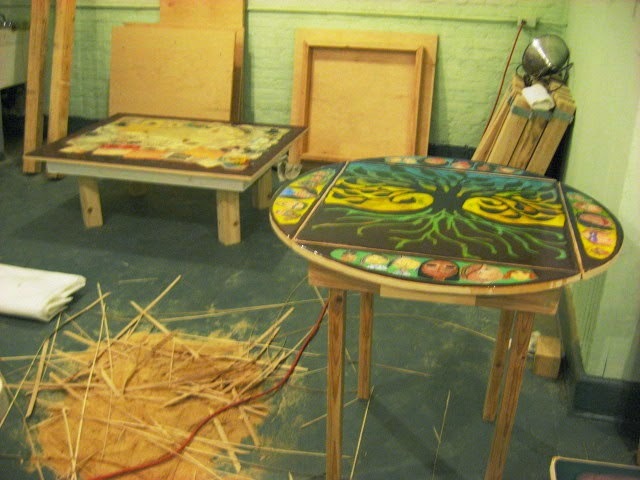 Maybe it's time for us get the table shop up and running again. It looks like I can make a lot more money selling tables to Kean than teaching there. Several months ago I completed my latest saint print, Bd James Strepar. The print is for my nephew (commonly known as Baby Jimmy), matching one done for his sister a few years ago. Did the first proof, then colored a second one, and the plan was to print a few more and color them to match, but I guess I never got around to it. Suddenly we're coming up on Jimmy's birthday, and I decided it would be a good time to finally present the family with a framed print. I know that I colored two proofs, but the only one I could find was the second one, which was still taped to a drawing board. No time to print a third copy and color it to act as a reference copy. But one thing I could do was take some specific color notes, so when I am ready to color more I'll know exactly what to do. 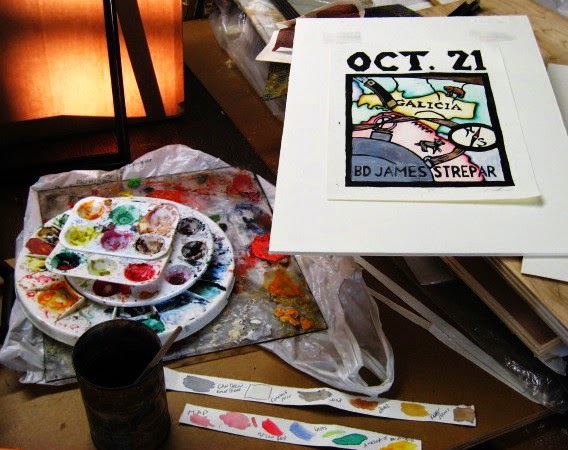 So in the early afternoon I drove up to the Studio, using my new Belmar Train tote bag to carry the drawing board with the print, the frame that the print would go into, and my long straight edge ruler. First task was to cut the print loose, trim the edges, and tape it to the backing board in the frame. While that dried, I worked on matching the colors. One thing I remembered was that not only did the map colors resemble those in an image of a 500 year old map, but I intentionally chose colors that related to ones available centuries ago. This print had a relatively simple color scheme, so it didn't take long to match all the colors and label the sources. Then I finished assembling the frame, gathered my stuff, and started working my way back south. In the evening, Jimmy's parents were happy with the print, and it was hung on the wall. Back in the Studio again today, but this time I was working for my class, not for myself. A few weeks ago my 2D class printed their woodcut project in class, with pretty nice results. That is, the ones who were there with completed blocks printed their projects. Three students were either absent or lacking the block. This week one of those three was there with her block, but the other two were still missing. 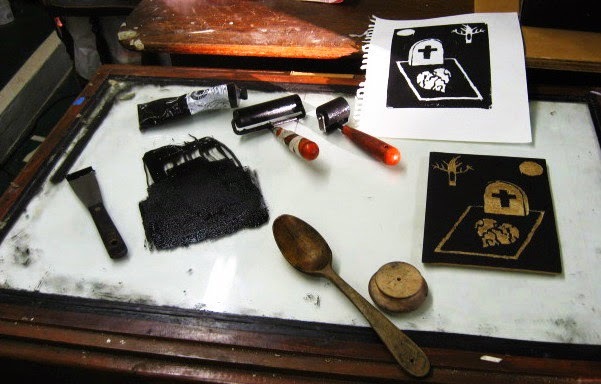 I had my printmaking bag in the car, and if all three were there with blocks I might have gone out there and brought it back to the classroom, but not for just the one. (if you're from my area you know what the weather was like that day- at one point some students were fearing just getting back to the dorms) The better solution in this case is just to take the block home and on a day when I'm in the Studio, just quickly crank out the print. Forgot the block at home yesterday, but I made sure I had it today. I used the same water soluble ink that I used in the classroom. The whole process, including clean up, took less than an hour. The bag is back in my car. If the last two students are ready to go next week, maybe we'll do them that day, or maybe I'll take them home again. It may just depend on the weather. 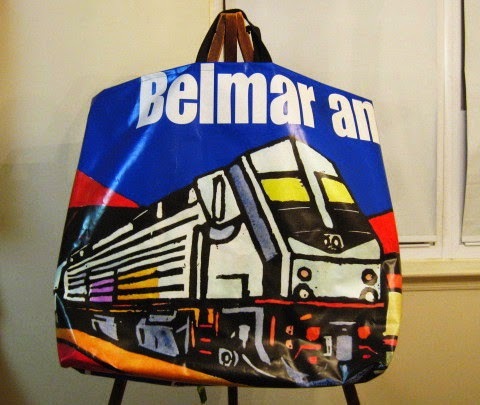 Early in 2014 the Belmar Arts Council asked me to take charge of one of the planned exhibitions, a show with a train theme. One of my many responsibilities was to create a poster image to be used in all promotion of the show. Working around many snowstorms, I drew and cut a block showing a train pulling into Belmar's station, in a style meant to resemble a vintage train poster. People approved, and the hand colored image was used for the postcards, website, large promotional banners, and I donated the original print to be raffled for fund raising. The banner idea is something they've been doing for a while, a commercial product printed on vinyl, weatherproof. Usually one is made to be put on the front of the Boatworks during the run of each show, but for this exhibition they made two- one for our building, and one that was hung over by the train station itself in advance of the show and the installation of the new train station mural that we had organized. Our current office administrator Rebecca has her creative skills in the area of fabric and fibers, has developed a way of making durable tote bags out of repurposed materials, and found that heavy duty banners worked well for this task. This train show was up in April and May, and at the time she told me she would eventually make me a large tote bag out of one of the railroad banners, anticipating the completion for maybe late November. After today's Studio session, I swung by the Boatworks on my way home to check up on things. We had the opening for the latest WUF show on Saturday night, and while it was well attended, none of my stuff had sold then, or since. 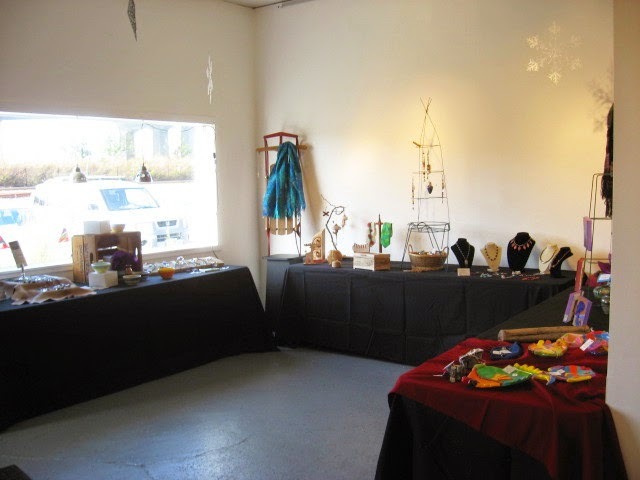 About one third of the participating artists were selling jewelry, so it's that kind of crowd we get. So no prints sold yet, but Rebecca did surprise me by having my bag ready to go. As the photo shows, despite being hung outdoors for months, the printed image is still in very good shape- no fading or tearing. The bag is about 31 inches wide and 26 inches tall, so it can easily hold a pile of 18" x 24" pads, a bunch of my exchange portfolio sets, or almost any of my framed works. Should be very useful. By the way, the other side of the bag is the continuation of the banner, so a little piece of the train station, and a bunch of text- big bold white letters against the deep blue sky showing part of the exhibition title, dates, etc. One thing she mentioned today was that the banner design was full of visual elements, compared to most of them which have a title and image and a lot of empty space. The way I figure it, you want good graphic design, get yourself a true graphic artist, and woodcut is the original graphic art. We've had over 1000 years to master the concept. The insides of her bags are lined with cloth, the pattern often relating to the theme of the outside. For a second train show tote bag (we had two banners) she found some train themed fabric, but for mine she had cloth with sayings from Confucius and images of Chinese cardboard takeout containers. I'd like to think it's because I dispense great wisdom, but I know it's mostly because she knows I get my Chinese takeout in Belmar. Back to work on the new supermarket block. After looking at the block for a while after the previous drawing session, I had some issues with the newest figure. 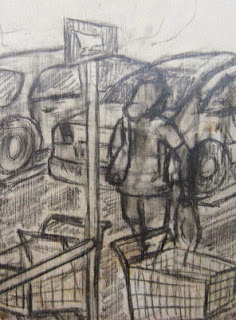 The scale of the figure was fine in relation to the cars behind her, but she seemed too tall for the shopping carts in front of her. So I shrunk her down a little more, redrawing her several times. The change is subtle, and difficult to see here because it's getting difficult to fully erase all the pencil on this block, but it does look a little different. 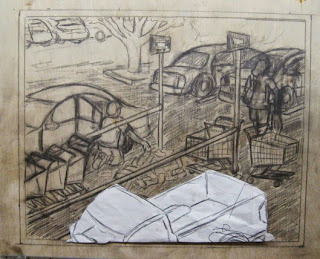 I also redrew the shopping cart directly in front of my pedestrian, shifting it down a little and making it slightly larger, effectively creating more space between it and the pedestrian. The biggest change in the drawing was redoing the pick up truck to match the scale changes I tried with cut paper last time. The larger size sets up a better relative scale from the truck, to the brick guy's car, to the background cars. There are still adjustments to be made all throughout the composition, but it's coming together. This afternoon/evening was the official reception for the 2014 Faculty Exhibition (or Salon as they are calling it again). The name may have confused some people, as I know at least one adjunct who didn't submit anything to it because she didn't realize from the subject heading in the e-mail that this was our latest faculty show. Although all of the faculty shows have been held in this same gallery space, the number of artists has gone down. Between full time and adjunct, I can think of at least six of us who were in the last one that aren't in this one. The two alcove spaces were filled with works from a full timer who retired and passed away recently, and I'm assuming the plan was always to have some as a tribute, but I wonder if the large number of his paintings was just to fill the walls that otherwise would have been empty. No problems driving north in afternoon, and I had time to stop at the secret cheese store on the way up to pick up a few bags of taralli (one my contribution to tonight's reception, since the college decided we weren't worthy of what they usually provide) and find close by parking in the faculty section. Not a huge crowd in attendance. The above photo is from tonight and shows the amount of visitors typically in the gallery at any moment in time, many fewer than the last show two years ago. More were generally to be found in the hallway by the food table. Most of the show's artists put in an appearance for at least part of the reception. There were also a few students around, mostly people who were there for late afternoon or evening classes. 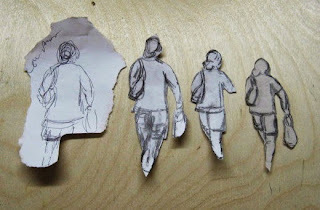 I saw several students who had taken my 2D, 3D, and Visual Thinking classes in recent years. I even had one student who took a special trip to see it, one of my Belmar printmakers, who actually lives up in Essex County. I'll bring my current fall class down on a week when it's convenient to the day's schedule. Both of my pieces got a good response. Whatever boardwalk you frequented in real life, the wheel game piece feels like one you played yourself. And while the tattoo studio is not based on any actual place on any boardwalk that I ever saw, it does relate to the Floating World aspect of the series, and it was a hit with students who are fans of tattoos. 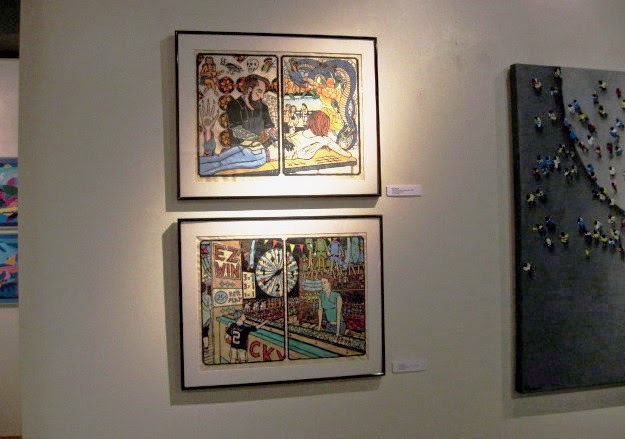 The fall 2014 Salon remains on display in the Howe Gallery in Vaughn-Eames Hall on the campus of Kean University through December 19, 2014. Gallery is open daytimes during the week. Admission is free, but parking is quite a challenge. This part of the country is enjoying a brief bit of nice mild weather before winter officially arrives. Took advantage of mid 60's temps and dry weather yesterday to get in what is likely the last full lawn mowing of the year. With that done yesterday, today's schedule was mostly traveling around by car doing various errands that didn't require optimal outdoor conditions. The one most relevant to this blog was getting back into the Studio to continue work on the latest block. One change not noted here yet happened last week- shading in the asphalt with a pencil prior to last week's crit, so people would feel the value balance better. As I'm sure I've written here before, every time I'm in a supermarket, I'm working on this series. Sometimes I'm just noting ideas, sometimes it's specific research. I've known for a while that I wanted to add a figure or two walking through the parking lot. A few days ago as I was leaving a supermarket I took note of shoppers in the parking lot, walking toward their cars with their purchases. Didn't have any sketch paper with me, so I just took in as much as could mentally and put one of them down on some scrap paper when I got home. In the above photo, that first sketch is the figure on the far left. (the piece missing from the lower right corner is the address window in the old envelope I drew it on) Sometimes when I'm looking to add something to an already existing sketch I'll sketch it onto paper, cut it out, and then place it in various parts of the composition to see how it's working. The scale of the first sketch was too large to fit into the scene where I wanted it, so I redrew it a few more times, getting smaller each time. 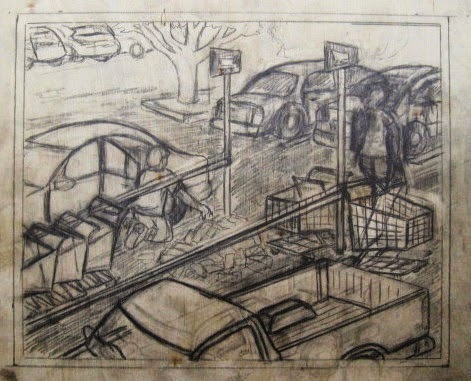 In the end I chose to place it in the upper right corner of the scene, in front of the car I have there, the feet conveniently behind a shopping cart so I don't have to draw them. A few people at the last crit also felt that the truck in the foreground should be bigger, to help with the relative scale of parts of the scene. What I told them I would likely do is increase the size on paper, and do another placed cut out test. No point in erasing a perfectly good truck sketch until I know I want to replace it. Besides, if I do redraw it, I want to have my model truck again to look at. Meanwhile, I sketched this one on paper copying from my block sketch, and stuck it on top of the composition. I will think about it in the coming days and make a decision soon. Lot of woodcut activity going on up in Union today, on the Kean University campus. 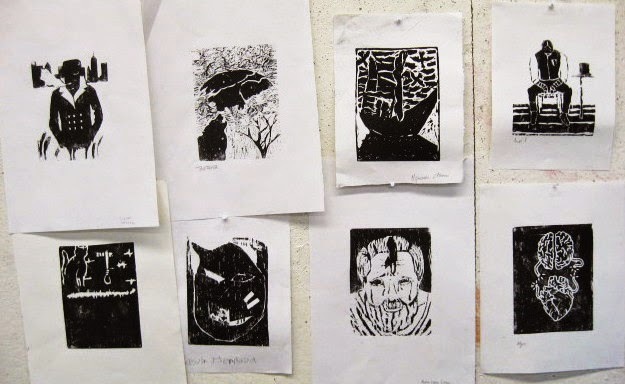 First, my 2D class was printing their woodcut assignment. Same one I've been giving for decades, an illustration from a literary work. Eight students showed up with their completed blocks today, so that's what got printed. Above are proofs of those blocks. I'm hoping that the other ones turn up next week. Last week I brought in two pieces for the latest Faculty show. The installation was scheduled for over the weekend, and it did get done. The show doesn't officially open until Thursday, but viewers were welcome to see the show today and so I took a quick peek. My contribution is two from the boardwalk series that haven't been shown on campus before. Not my newest pieces but relatively recent, and large enough to hold their own in a big room where most of the art is pretty big. The reception is on Thursday, November 13, 2014 from 4 to 6 pm in the James Howe Gallery in the Vaughn Eames building. The gallery is open weekdays through December 19th. During the school year, Saturday is usually a good day to catch up on stuff, though the school stuff tends to pop up from time to time. Today at the Boatworks was the intake for the WUF show. Last week I had printed a few more bookplates, and on Wednesday I officially registered online for the show, and then stopped by to pick up labels for my entries. But I hadn't done anything since, so this morning I had to finally finish the packaging of my small prints. Not that difficult. The rules asked that we not put a whole lot of stuff about ourselves on the pieces. I was told that what I had already on them was no problem, but I had created new versions of the labels anyway, and substituted them in some cases. For all I had to peel off old code/price labels and replace them with new ones, which would match the inventory sheet I had to submit. The only new packaging was for a set of new bee themed bookplates, ones I printed last week. They did ask that all artists putting things into the show provide some kind of display system, and I had one for that. Years ago I had acquired a display rack from a store going out of business, something that seemed perfect for my small product work. 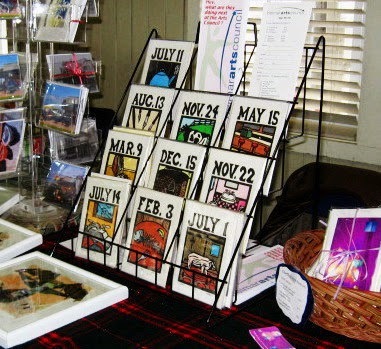 The above photo is from a BAC holiday sale from years ago, which was in the now destroyed Taylor Pavilion. A few days ago I had picked up the rack from where I had it stored in Manasquan. Around midday I loaded all that stuff in my car and drove it to the Boatworks. Stuff was still coming in, so the sale area wasn't quite organized yet. That begins on Wednesday, and people there seemed to have things under control, so I headed to the Studio and a bunch of other tasks. First thing I did at the Studio was a common thing this time of year, grading. I had left the completed ink wash projects from my Drawing class in the car last night, convenient for my trip to Ocean Grove today. Took photos of a few better ones for future class use. Also picked up printmaking stuff I'll need for this week's 2D class, and left that in the car. The rest of my time there was spent looking. I know that I had done other bookplate designs besides the set of four, but so far I couldn't find the blocks to go with them. At the end of the day I still hadn't, though I did locate the blocks for the mini-saints. Not that I expected I would sell out of the ones I had in stock, but if there is a sudden run on what I have, I know I can crank out some more. Another thing I was looking for was particular blocks from the Fourth of July. Following the WUF show, the next thing in Belmar will be the annual member salon, with this year's theme being food. As part of it, they want participants to bring food based on the art to the reception. Whether or not I participate in the show I don't know yet, but I do know that after art processes, the second most common theme in the Fourth of July series was food, mostly stuff I made. With Sandy having eliminated about half the blocks, did I have any left that would be relevant? I've learned that hot pasta dishes don't work at pot lucks, but I've had luck with breads and desserts. The blocks I have do give me some possibilities there, something to consider. On the way home I stopped at the store to pick up a hunk of Locatelli (hot pasta works at home just fine) and did a little research while there. I haven't touched the new supermarket block since the crit, but one change I do expect to make is adding a few pedestrians to the scene. So on my way in and out of the store I spent time carefully observing people walking in the parking lot. Didn't do any sketches, but took mental notes and turned them into some very rough sketches back home. Eventually I'll have to decide where they will go in my scene. It's critique time again. Molly said she was definitely up for it, so I got word out to the dozen people on my list. Didn't hear back from many, but I had picked up some cheese near my school, so I headed to Ocean Grove to see who showed up. We had six people show up, five bringing art. 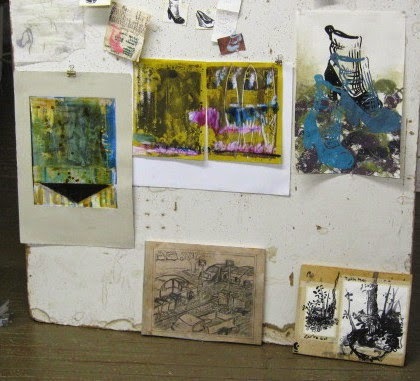 Above, clockwise from top left- two mixed media prints from recently arrived in Ocean Grove printmaker Catherine, a silk screen print from Molly, two ink drawings from Molly, and my current block, not yet seen by anyone in the group. 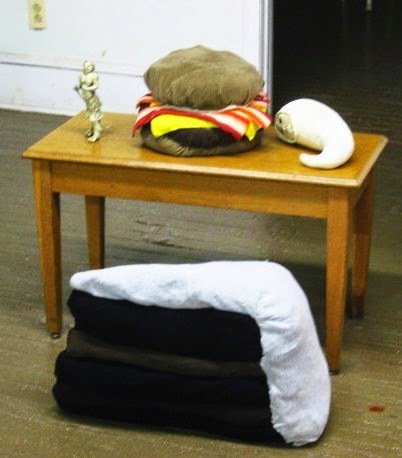 Below, two stuffed fabric pieces from Lisa, and two ceramic pieces from Margery. Reaction to my block was very positive, a common theme being that the expanded composition was an improvement over the early sketches of just the man by his car. A few small suggestions were made, ideas I'll play around with in the coming days, and if they look promising, I'll consider a few changes.